"No Radiation For You" blog: No water smart meter? pay for 100 Cubic metre of water extra (~960 NIS, ~USD266)!!! No water smart meter? pay for 100 Cubic metre of water extra (~960 NIS, ~USD266)!!! The following report is from Bat-zion Shlomi , from Afula, Israel. It was sent to me, following my request to share with my English readers. "Notification of Unusual water consumption"
It said that in September-October 2016 our water consumption was very unusual - 291.11% more than our usual approximate consumption. The letter was quite long because it details the possible reasons for the deviation in consumption., adding that if we know we used more water than usual, we can just to pay the required amount. "If you wish you can contact the customer service department, and request that they check the water meter for a certain fee." 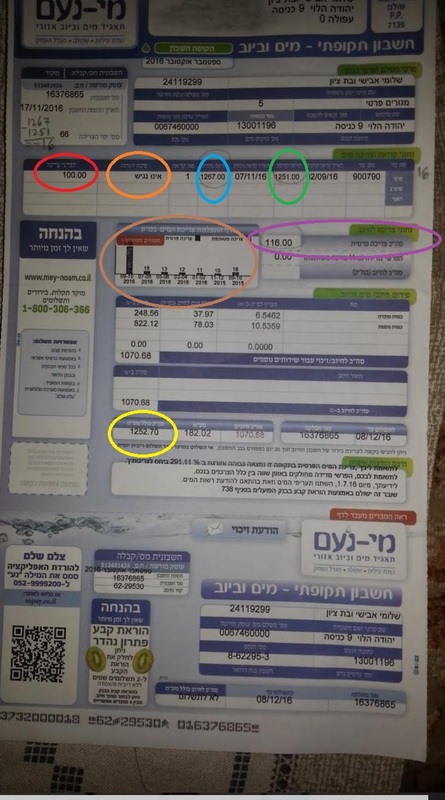 The second letter was the actual water bill - 1070 NIS compared to our usual 80-90 NIS per two months. I was amazed at the sight of such an astronomical sum. I prayed that somehow this would prove to be a mistake. Then I looked at the previous bills and noticed the difference in cubic meters between last and the present reading of the meter was 16. However, on the next line it said: "Total private consumption - 116 cubic meters." In other words, they're trying to charge us for an extra 100 cubic meters of water never consumed. The next day - Avi Shamir, our friend and neighbor who refused a smart meter as I explained the consequences to him, tells me he too was charged for 100 cubic meters more! This morning I went to the offices of the water company. As I waited in line with five others, one man started to say something about the reason for coming - and then I told him quietly and civilly that I would not have a smart meter and that may be the cause for the inflated bill we got. Opposite us sat a clerk who was busy with another customer and she started yelling at me in front of everyone : "You stop talking! This is called slander, you're getting him all worked up and he'll be angry when he comes to me!" I stopped. I felt it was useless to answer her. I actually tried but she didn't listen. When it was my turn they referred me to a side room with another clerk (I think it was wise of them - to isolate those who may "make waves", i..e. say things that other customers had better not hear). The clerk ( Liat, I asked her name) looks at the computer screen adn says, after I explain that they charged us for 100 cubic meters of water we didn't use: "I see you refused a smart meter. Until you agree we are charging you this 100 extra cubic meters." I ask who decided on this penalty and the response is - "the company". I try to show her the page of conclusions of the meeting of the Economic Committee at the Knesset, which took place on July 4th 2016, saying that installing smart meters must stop until answers are given from the Ministry of Environmental Protection and the Chief Rabbinate of Israel (for fear of desecrating the Sabbath by use of the smart meters). The clerk simply kicked me out - "I don't have time to read your letters, I see customers here, this letter doesn't interest me." 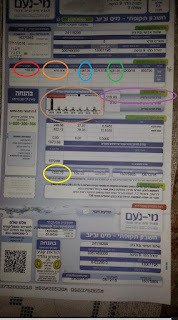 So now it's clear - they decided to fine us by 100 cubic meters (960 ₪ = 266$) and later they told my neighbor Avi Shamir they'll do that every 2 months "until you agree to smart meters", so she said. It turned out that they already took the money from our account before the letter arrived in the mail (because we have a standing order). Light Gray - chart that shows the changes in water consumption over the last few months.